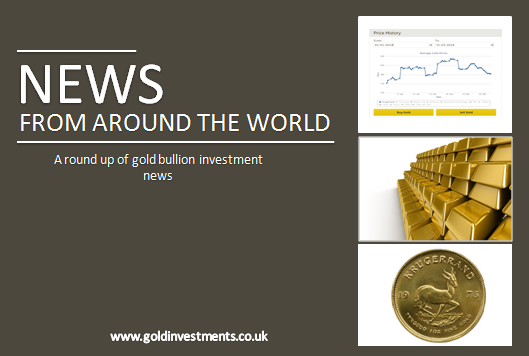 August 2015 Gold News From One Of The Oldest Bullion Houses In The UK. Demand for gold across the world has fallen to a six-year-low. The largest consumers of the precious metal – China and India – bought a combined total of 915 tonnes in quarter two, down 12 per cent since this time last year, according to the World Gold Council. Oliver Temple gives his expert analysis for the low gold prices. He discusses whether weak demand is fooling some investors and that actually now is one of the best times to buy. See his informative article here. Low oil prices are driving Venuzuela to dig in and sell its gold reserves. The country is currently trying to repay its foreign debts using the reserves. Around 95% of the South American country’s revenues comes from oil exports. According to Investment Company – Morgan Stanley – the country has been drawing down on its gold reserves by about $1billion a month. A 500 gram gold bar worth more than £11,500 (€16,000) has been found by a 16-year-old holidaying in Germany. The teenager was swimming close to the shore of Bavaria’s Koenigssee lake last week when she discovered the gold bar. The area was then searched by Police divers to see if they could find any more gold, which they could not. It is not clear where the gold bar originally came from. Promising to be a truly amazing ‘gold’ experience, Gold Investments is giving away two tickets to see the England Vs Rugby League game at the Olympic Stadium on Saturday 7 November 2015. What’s more the bullion house is also throwing in a three course meal and champagne. There will also be guest speakers. Anyone buying gold from Gold Investments between now and Friday 18th September 2015 will automatically be entered into the prize draw. The Gold Investments’ Gold Club is free to join. Members receive regular gold news, analysis, and special offers. Why not join our special club? Find out more today. Please feel to share this gold news article by clicking on the buttons on the left.